Facebook Removed Crop Circle Activist Nancy Talbott’s FB Page. Why? Why this severe measure was undertaken by Facebook remains unknown. Below I explain my hypothesis, and it centers on both the recent and past politics of UFOs – Exopolitics. Dr. John E. Brandenburg, PhD (photo left) is preparing to present a research paper at the prestigious September 13-16 AIAA (American Institute of Aeronautics and Astronautics) conference in Long Beach, CA. The AIAA conference is “prestigious” in that not just anybody is invited to present a research paper at this conference. 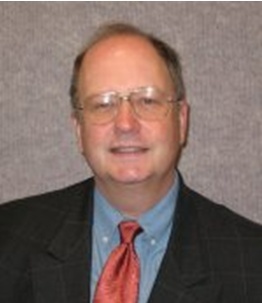 In his research paper Dr. Brandenburg, a well-credentialed nuclear physicist with connections to the U.S. Department of Defense, will present solid scientific evidence which proves that 2 deliberately-engineered nuclear blasts occurred on Mars in the remote history of that planet, nuclear blasts that were intended to essentially sterilize the surface of Mars of all life. It apparently remains unknown who did this, or why this was done. Dr. Brandenburg has concluded that this “dreadful” (his word) act was executed by a technologically advanced but decidedly non-human (i.e. ET) intelligence. It is also very important to note that Dr. Brandenburg has previously made his conclusions known to the U.S. Department of Defense and, after 6 months of review and deliberation, the DOD gave Dr. Brandenburg and his research group the go-ahead to make these results public. The significance of this cannot be overstated. Nancy’s Facebook post mentioned the name of Dr. John H. Gibbons as having received from Laurance Rockefeller, just after Gibbons’ tenure as OSTP Director for the Clinton Administration, a copy of a remarkable XRD (X-Ray Diffraction) study of crop circle soil, a study that was financed by Laurance Rockefeller. This connection would potentially (likely) indicate that Dr. John H. Gibbons, the OSTP, and the Clinton White House also had an interest in crop circles, as well as UFOs. In Nancy’s case, having the name of Dr. John H. Gibbons crop up in her Facebook post as a reminder that he was President Bill Clinton’s OSTP Director during the years when the Rockefeller Initiative was in full swing was apparently a sensitive issue for some. There exists a photo (below) of current Democratic Presidential candidate Hillary Clinton walking beside Laurance Rockefeller while holding a copy of the book Are We Alone? Philosophical Implications of the Discovery of Extraterrestrial Life written by University of AZ astrophysicist Paul Davies. Given this, there can be little question that Hillary Clinton not only had an interest in the topic of intelligent extraterrestrial life, but that it is also highly likely that she has intimate knowledge of what was discussed among Laurance Rockefeller, Dr. John H. Gibbons, and a host of other individuals connected with the Clinton (her husband’s) Administration in meetings that are proven to have occurred through Cameron’s “Rockefeller Initiative” FOIA documents. Nancy’s Facebook post added one more piece to that puzzle. 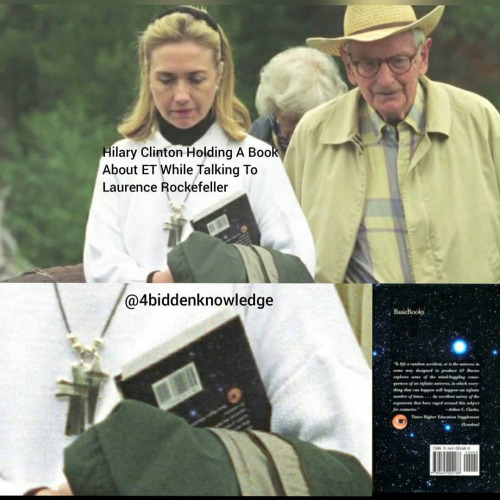 Hillary Clinton with Laurence Rockefeller holding the book “Are We Alone” , written by Paul Davies. UFOs and crop circles are clearly very sticky issues for a woman who is the current front-runner to become the next President of the United States. Washington UFO Disclosure lobbyist Steven Basset has been doing his level best to entice the mainstream media to pick up on Hillary Clinton’s potential insider knowledge about what was said at the meetings described in those Rockefeller Initiative” FOIA documents but, to date, they haven’t really bitten down. At least not to a degree that would make UFOs and crop circles become major issues in this current Presidential election – yet. However, given Dr. Brandenburg’s astonishing conclusion that he will present at the AIAA conference approximately 2 weeks from today, extraterrestrials, UFOs etc. are about to become the focus of polite conversations around the world. The phrase “shock waves” comes to mind. For Hillary Clinton to maintain a high degree of plausible deniability with regard to any foreknowledge (20 + years of foreknowledge) of this “new” reality will be important for her credibility in this Presidential campaign. This is not to imply that Hillary Clinton would have had any choice in this. My guess is the National Democratic Party and Hillary Clinton want little to do with either of these topics before the November election. They hope to (rightfully) allow this to fall on President Obama’s shoulders. She would certainly not want to admit that she has known about the ET / UFO reality for 20 + years but “chose” to withhold this information from the American people over that entire time. After the election, it’s anybody’s guess what Mrs. Clinton will do as our POTUS with any information she may be aware of about these issues. She has made rather surprising and I think courageous statements indicating that she will disclose information concerning UFOs and extraterrestrials that does not compromise national security concerns after she is elected. BRAVO! However, there can be little doubt that, before she is elected, she will make every effort to avoid having to directly confront persistent questioning about what she actually knows and has known about these topics. After Dr. Brandenburg’s presentation at the upcoming AIAA meeting this September 13-16, and if our nation’s mainstream media has not been completely cowed from approaching such “third rail” issues, it is almost unimaginable that the UFO / ET topics will not become front and center issues for President Obama and for both Hillary Clinton and Donald Trump. If you think “The Wall” Mr. Trump wants to build for Mexicans will be expensive, ineffective, and politically incorrect, then just wait until he finds this out! That Nancy’s Facebook post opened another potential avenue linking Dr. John H. Gibbons to Laurance Rockefeller, to the Rockefeller Initiative, to the Bill Clinton administration, and thereby to Hillary Clinton was a line that simply could not be crossed at just the time when Nancy presented her report mentioning Dr. John H. Gibbons in her Facebook post. If anyone else can come up with a better explanation for why Facebook suddenly removed Nancy Talbott’s FB page for a reason that even she has herself has been unable to explain, and almost immediately after she posted a story mentioning the name Dr. John H. Gibbons, the “you’re a daisy”, and I want to hear it! We can be certain that the roll-out of “UFO Disclosure” has been carefully planned and is being orchestrated in such a way that it will result in minimum disruption to current political processes. The XRD crop circle soil study sent by Laurance Rockefeller to Dr. John H. Gibbons that Nancy mentioned in her FB post set off alarms intended to obviate the possibility of any additional questioning of Mrs. Clinton concerning her knowledge about UFOs, crop circles, and / or her possible awareness of details involved in the “Rockefeller Initiative”. After the September 16 presentation of Dr. Brandenburg’s research paper at the AIAA conference then all bets are off, and President Obama will need to have his game face on because he is going to have some serious explaining to do. I do not envy his position, but he is the man in charge at this point in human history and he will be the individual who will (at last) be required to openly confront these issues when Dr. Brandenburg presents his findings, the veil of secrecy is finally lifted, and the obvious questions begin pouring in. End of speculation. To Facebook: Please reinstate Nancy Talbott’s Facebook page. She is a kind and honest person who is only trying to tell the people the Truth. Facebook’s action has severely handicapped her ability to function as a conduit of important information that we all need to know. Please do the right thing.